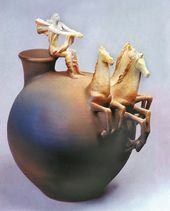 Maloletkov chose unglazed porcelain (biscuit) and chamotte for some of his first ceramic works. The artist moved beyond traditional methods of modelling quite early, as is evident in his 1973 relief "Mozart". Experimenting freely with chamotte, he made the most of the plasticity and structural properties of the material to express the inner reverence of the musician, as well as the depths and space of the whole composition. His porcelain reliefs, plaques and three-dimensional works from the 1970s - "Ice Hockey Players", "In the Park", "Oriental Bazaar" and "Student" - are defined by their laconic artistic means, impeccable sense of composition and fine aesthetics. Maloletkov's artistic interest extends beyond the narrow objectives of applied art, and lies primarily in the process of form-building, something that drives his constant search for new artistic means and demands the utmost skills of execution. 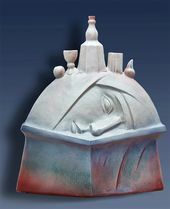 His works often evoke the most diverse and unexpected associations, and are inspired by a wide range of topics: mythology, religion, history, literature and stories of everyday life, all embodied in the language of polychrome sculpture, enriched with spiritual tension, symbols and metaphors. The three-dimensional designs for the interiors of the Moscow Central Department Store, or GUM (1986), in which Maloletkov reflected the history of Russian traditional costume, serve as an example. 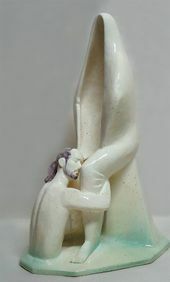 Unfortunately, the project itself was never implemented, but the artist later embodied it in a large series of ceramic works, "Creators of the Spirit". 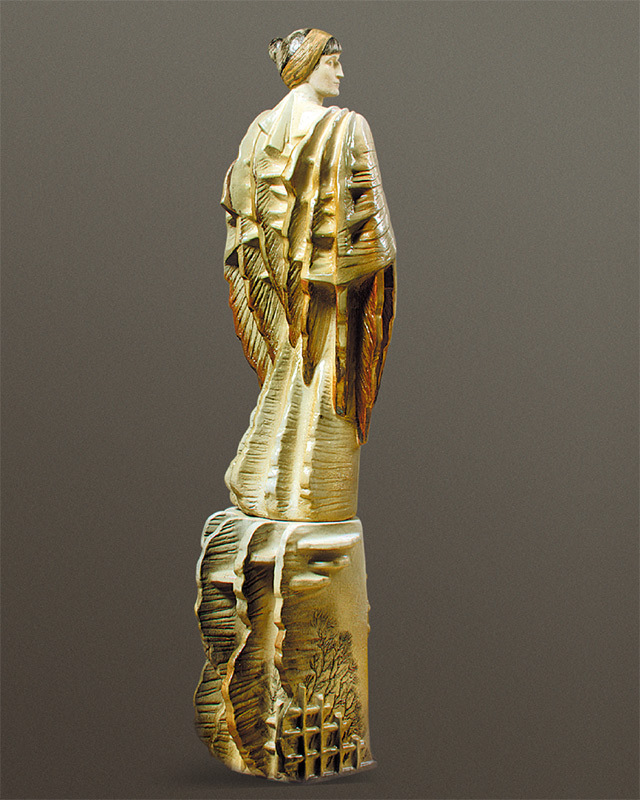 These sculptural compositions express genuine admiration for outstanding figures of Russian culture such as Alexander Pushkin, Nikolai Gogol, Sergei Yesenin, Marina Tsvetaeva, Anna Akhmatova and Vladimir Tatlin. 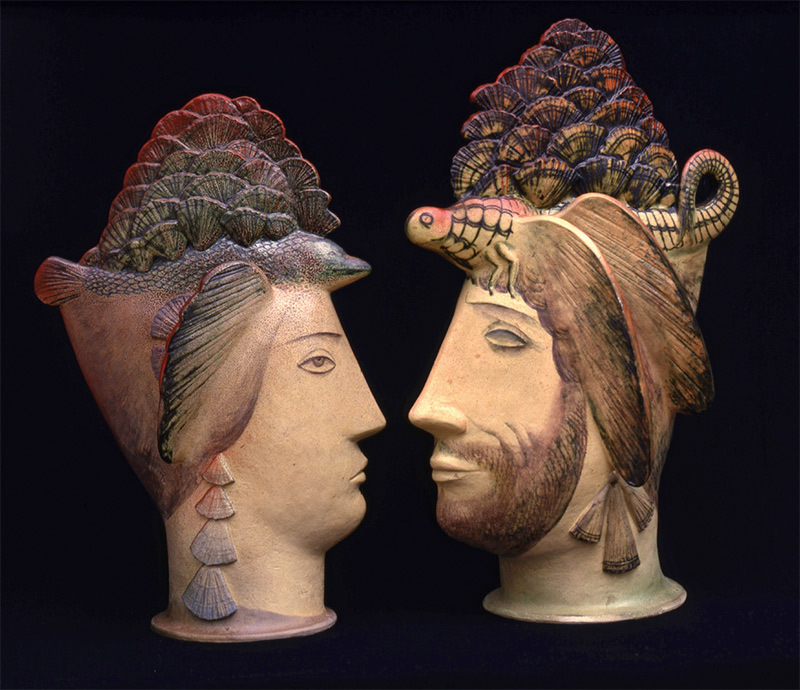 The portrait resemblance and emotional world of each of the subjects is naturally connected with the plasticity and constructive properties of polychrome ceramics. 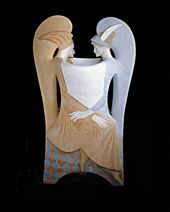 The author applied a synthesis of different materials (ceramics and textiles) in his three-dimensional composition "Poet and Muse" (1994), such an unusual choice accentuating the tragic nature of the relationship between the Russian poet Sergei Yesenin and American dancer Isadora Duncan. 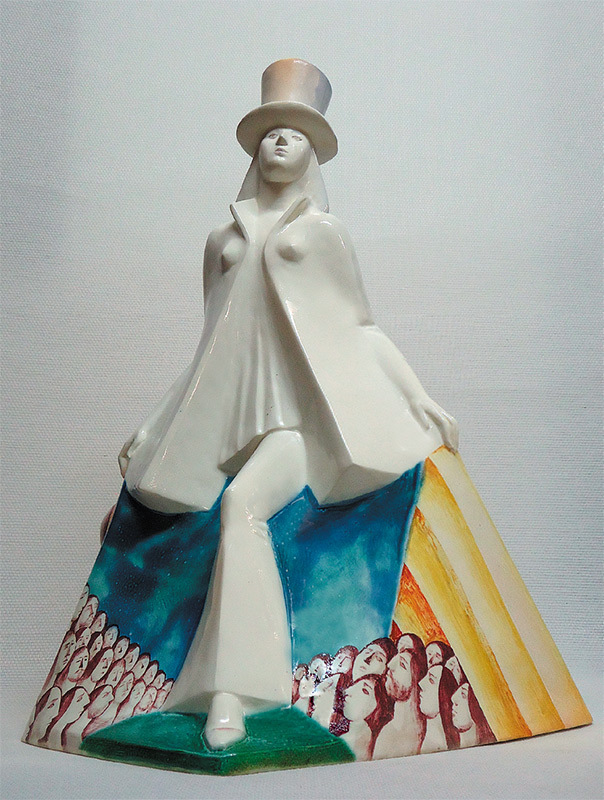 Skilfully avoiding adding any fictional narrative to the composition, the artist focused on finding the right figurative solution and revealing the plasticity and colour properties of ceramics. 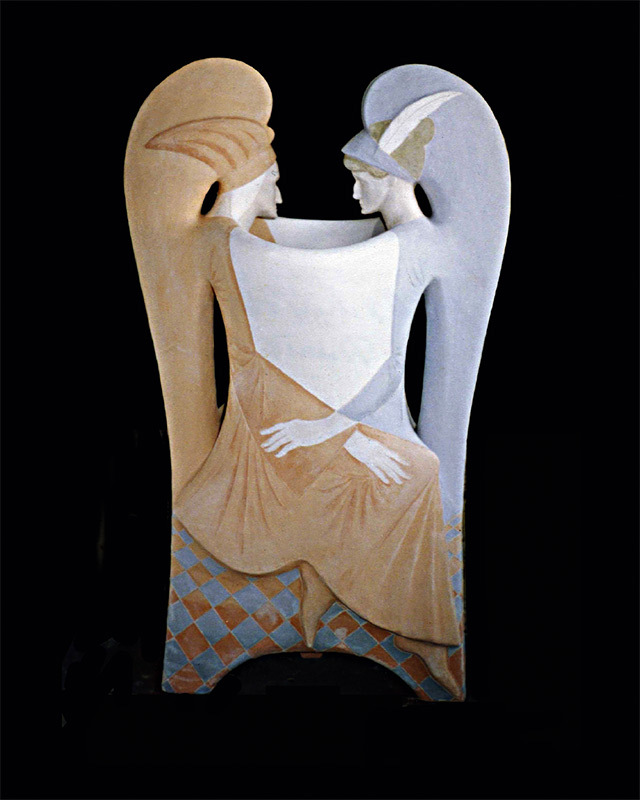 His monumental works "Marina Tsvetaeva" and "Anna Akhmatova" (1991, both Tretyakov Gallery) were an essential development on the artist's architectural design for the interior of the Moscow Central Department Store. 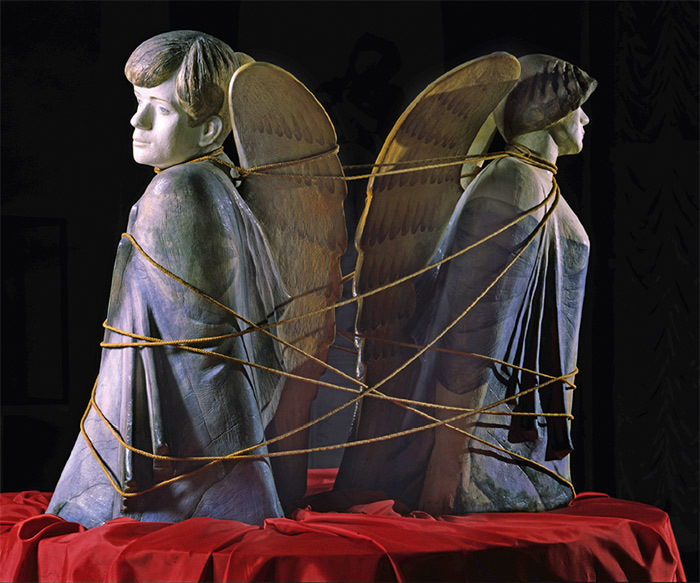 In these figures of the two great women writers of the Russian Silver Age, the sculptor thoughtfully captured their internal tension and strength of spirit, emphasizing the tragic stories of their lives in the symbolically tied wings. 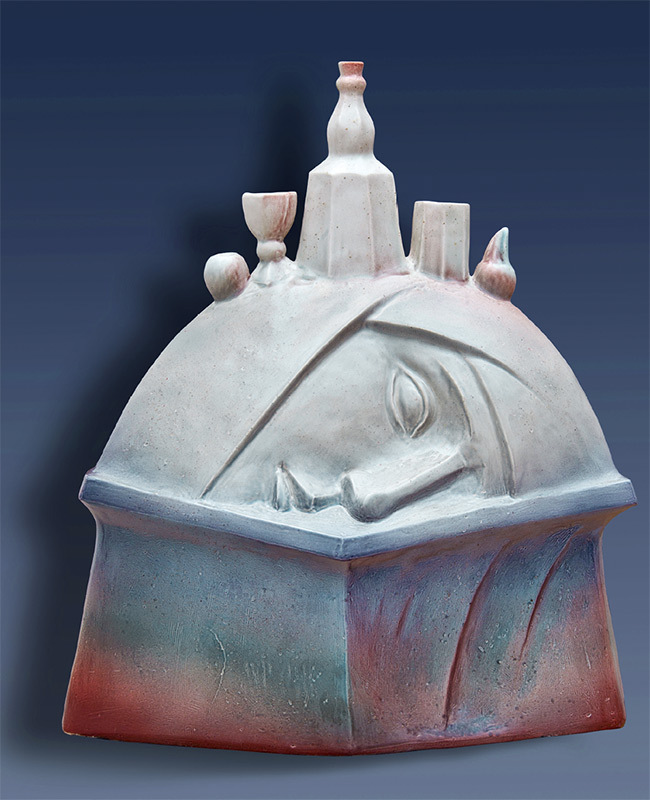 All of Valery Maloletkov's works are filled with allusions and symbolic meanings. His work "A.S. Pushkin" (1998) tells the story of the final days of the great Russian poet and the treacherous intrigue which culminated in his duel with Georges DAnthes. The poet's image was modelled with great accuracy. 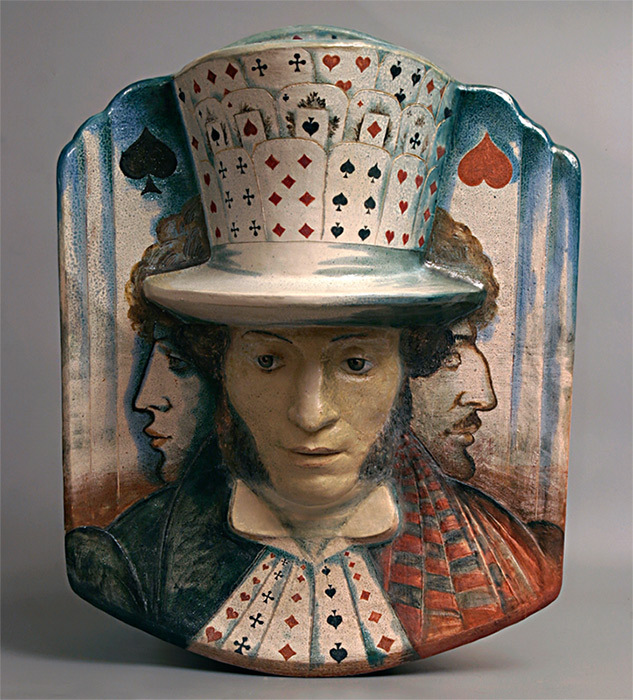 Its compositional solution is especially interesting: the poet's head is placed on the flat surface of the relief while the cylinder is decorated with playing cards. On the left, portrayed as the Queen of Spades, is Idalia Poletika, or "Madame Intrigue" as she was called by members of high society. DAnthes, the poet's fateful rival, is easily recognized as the Knave of Hearts. The playing cards are arranged in various combinations, reflecting the complexity of the poet's life like a game of "solitaire", and the tragic predestination of his fate. With minimal artistic means, Maloletkov reveals the card game narrative in the life of Pushkin, who more than once put his literary masterpieces at the mercy of chance. The artist has constantly developed the themes and subjects that are closest to him throughout his artistic career, each time embodying them through a new and unexpected interpretation: among the latest such works are "Vladimir Tatlin" (2015), and "Eternal Gogol" (2015). 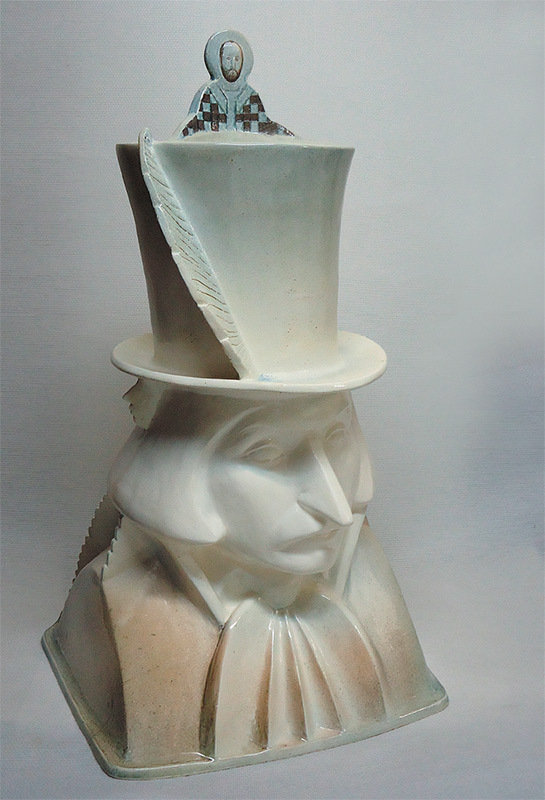 The master's desire to reveal the structural properties and plasticity of faience distinguishes "Eternal Gogol", in which the integrity of the volume is supplemented with distinctive and precise details, consistent with the chosen scale. Each element of the composition, enriched with allegorical and symbolic signs, carries a hidden subtext. The rising ladder reflects the evolution of the writer's creative genius and recalls Gogol's last words: "A ladder! Hurry up, bring the ladder!..". The feather pointing to the sky symbolizes the writer's creative mission, while the single wing means the loss of inspiration, the end of the flight of creativity. Maloletkov seeks to express Gogol's inner drama, and the writer's decision to stop creating during the last years of his life, through both composition and colours. The image of St. Nicholas, the patron saint of pilgrims, is the culmination of the composition and brings to mind the first name of the great writer. The monumental spirit of this artistic image is emphasized by its silver and grey colour palette, completed with the fine and graphically painted figure of the saint. Maloletkov has increased the structural and semantic tension, developing the reverse side of the sculpture: he divides the composition into parts with different characters, creating the writer's image in a way that is both integral and full of internal fracture. This method of formally dividing the work into parts that differ in meaning is particularly characteristic of the master's most recent works. Maloletkov's three-dimensional compositions require to be viewed from all sides, since each of the images is endowed with a multi-layered story and philosophical subtext. 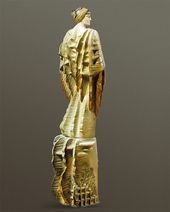 "Peter I" (2014), a sculpture accomplished in a very original form, is a good example of that: the author complements the image of the severe Emperor-Reformer with a courteous image of Catherine I, which the viewer can only see after inspecting the work from all around. The decor of the Empress's dress is enriched by a heraldic relief brooch with a double-headed Imperial Eagle which emphasizes the important role played by Peter's wife in his endeavours. The distinct parts of this work are united by the figures of Catherine I and Willem Mons sitting in a boat. The sense of duality is manifested in the boat itself as the symbol of both the family links of the royal couple, and the transition from one world to another. As we know, Mons was publicly executed in 1724 for his love affair with Catherine I.
Maloletkov has always been concerned with tragic life-stories of prominent figures who have contributed significantly to world culture. He genuinely believes that, "in the current times of great turmoil, troubles and instability, these legendary individuals provide invisible support to each thinking and caring human being, helping him to find inner harmony, confidence and peace of mind." His "John Lennon" relief from 1984 is one such example: the ingenious interpretation of the personality of the composer and singer of the legendary British pop group The Beatles, whose life was tragically cut short, is united seamlessly with the volumetric font used for the image of the band's title. 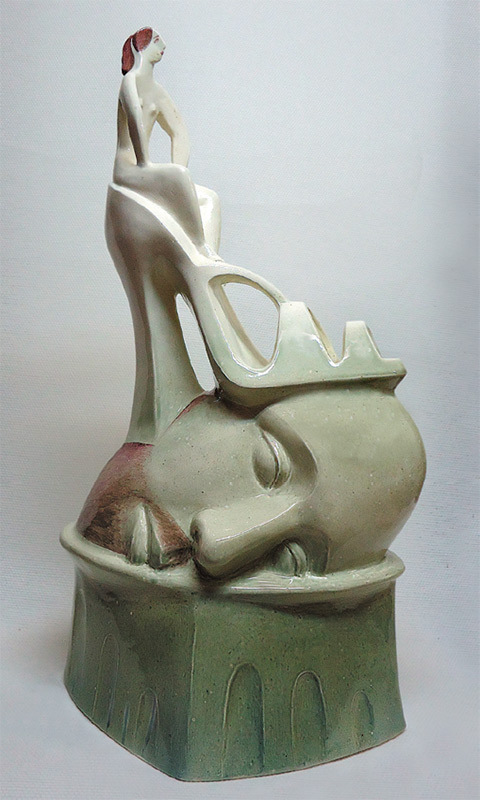 In his sculptural composition "Salome" (2015), the artist not only conveys the nature of his subject, but also challenges traditional perceptions of her image in art. The many works that have been inspired by the story of Salome throughout history are well-known, but Maloletkov reveals a new side of this woman who expresses remorse and sorrow about the crime caused by her thoughtless whim. The whole drama of the plot is expressed in spare, laconic means, the plasticity of artistic language complemented by a graphic representation of John the Baptist's severed head. The use of associated graphics emphasizes the monumental nature of the sculptural form. 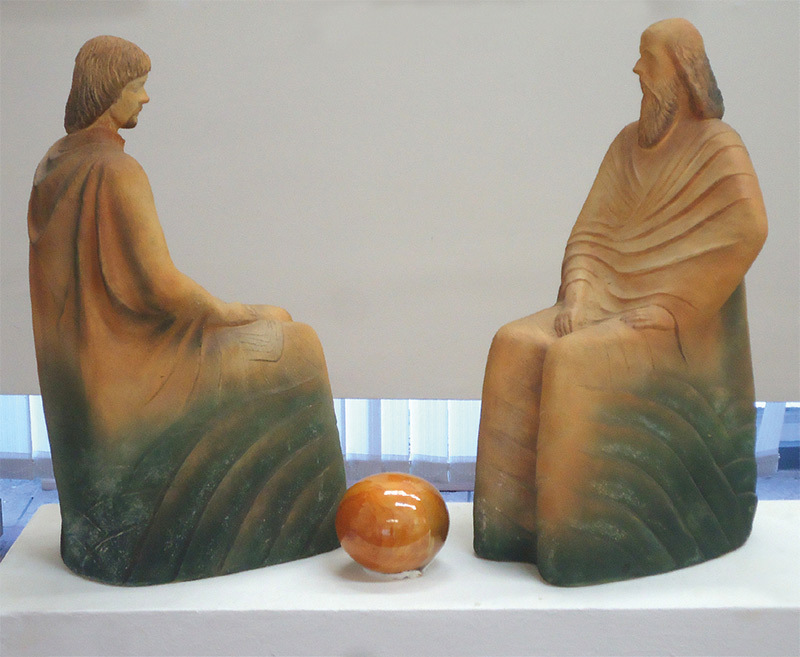 The artist's long-standing interest in the origins of Christianity is reflected in his "Journey of the Apostle Thomas" (1998), which tells the story of Thomas's last years spent in India, where he was martyred for preaching Christianity. Through the laconic language of plasticity and thin colours, Maloletkov has created a powerful and convincing artistic image. The depiction of the bull, the sacred animal of Indian culture, adds deep philosophical meaning to the work. With the use of metaphors, symbols and allegories, in his composition "Russia" (2015) the artist has created compelling images symbolizing the loss of traditional values in our culture and everyday life. In the sculptural works "The Bearing Wing", "Adoration", "Headstand" and "Emancipation" (all from 2014), Maloletkov reflects on shared spiritual values, and on today's most pressing problems of Good and Evil. In "Road to Nowhere" (2014) he applied new stylistic methods - the work is distinguished by its visual integrity of perception, laconic shapes and new interpretation of colour and the structural features of clay. A conventional language of plasticity and rich colours allowed the sculptor to create an artwork of a qualitatively new form compared to his previous work - almost an abstract symbol, a sign, which combines bright originality, artistry and light irony. 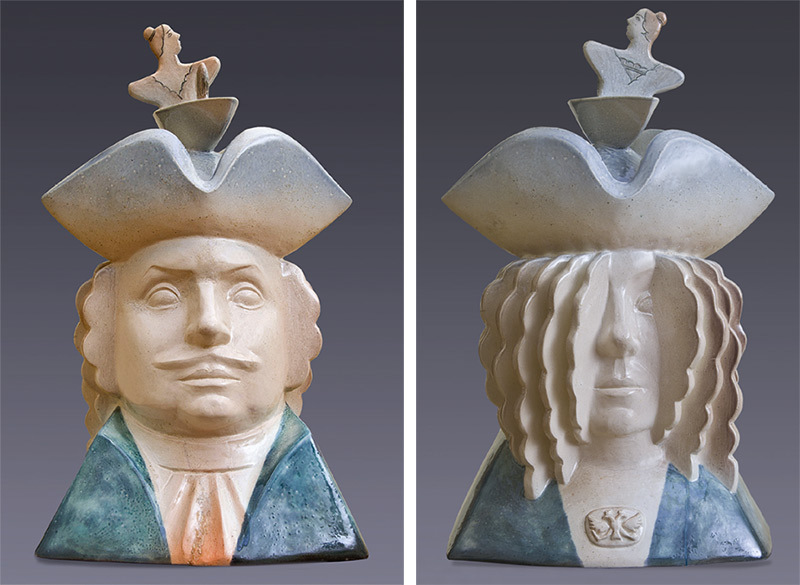 Today Maloletkov frequently experiments with the sculptural plasticity of faience, achieving brevity and elegance of form using the slip-casting method of creating thin-walled faience castings. Driven by an insatiable desire to expand his artistic palette, Maloletkov has recently created a number of sculptural works in bronze - "Walking Woman", "Walking Man" and "Seated Woman". Regardless of the material through which the author's ideas are brought to reality, they are always characterized by their high skill and exquisite artistry. 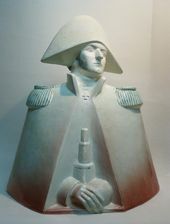 In addition to creating unique objects presented at exhibitions, Maloletkov has worked long and successfully in the field of monumental art. 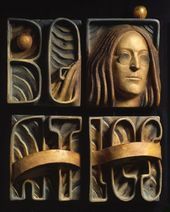 One of the many architectural works worth mentioning is the relief "Music", from 1977. Music has always been among Maloletkov's most cherished themes - not only because his mother was a pianist and he grew up in a very musical environment, but also because of his own innate musicality, and the sense of rhythm and improvisation that is crucial to his multi-dimensional creativity. Among the most grandiose monumental works of Vladimir Maloletkov was the grand sculptural composition created in collaboration with Alexander Belashov, Mai Miturich, Maria Favorskaya, Alla Pologova, Olga Malysheva, Yury Chernov, Viktor Duvidov and others for the interior of the Moscow Museum of Palaeontology built by architects Yury Platonov and Vladimir Kogan. In 1983, Maloletkov created the "Sea Lilies" and "The Birth of the Sea" reliefs for the multi-level space of the museum entrance hall. Fossil ammonite - a symbol of underwater palaeontology - inspired the compositional centre of "The Birth of the Sea". The ceramic shell was placed in the middle of a five-meter circle consisting of spiralling natural proto-forms with huge wings outstretched in opposite directions. This large- scale project has been recognized in the Guinness Book of Records as the largest work of 20th century monumental ceramics. Maloletkov has also made a considerable contribution to the field of graphic art, art photography, literature and the theory of art, remaining an innovator in all his artistic endeavours ("Three Merchants. Moscow" linocut and the "Camera" etching, both created in 1967). His interest in the fate of prominent personalities has also been reflected in the graphic series "Life of Alexander Pushkin" (2005), "Florentine Exile" (2006) and "Mikhail Vrubel and Nadezhda Zabela" (2009), all achieving both remarkably accurate portrayals of the subjects' physical features and deep comprehension of their personalities. For Maloletkov, sketching has always been more than just a means of realizing a new idea or reflecting on a sudden artistic impulse, instead becoming an independent field of art. His first sketches of ideas can be considered separate works of art that reveal the artist's worldview. Maloletkov is inseparable from his sketch album and pencil; he draws constantly and everywhere. His inquisitive artistic nature and abundance of new emotional experiences demand to be graphically realized without delay. "Drawing has become a constant necessity in my life. It connects me with the outside world like an invisible umbilical cord, not allowing me to turn into a boring conceptualist who only produces stillborn works and suffers from incurable narcissism. Over the years, drawing has become a kind of 'graphic confession'. It helps to develop a clear outlook, and avoid getting lost in the wilds of art or slowly slipping into a soulless void. Drawing constantly feeds my desire for artistic truth, which for me is the highest possible truth there is," the artist has said. Maloletkov has also turned to photography to capture the brightest moments of his life and impressions, so that they could later be embodied in a variety of materials and techniques. As independent art works, his photographic images are distinguished by their high professional quality and individual style. In addition, he has implemented his deep artistic knowledge and experience of life in literary works and research into art theory. Among his published works are "Between East and West" (Moscow, 2003), "Drawings from the Diary" (Moscow, 2005), "Moments of Life" (Moscow, 2005) and "Mosaic of Memory" (Moscow, 2013). His impressive monograph "The Cup of Destiny" came out on the eve of the artist's anniversary exhibition at the Russian Academy of Arts held in Moscow in January-February 2015. In 2010 Maloletkov published his fundamental study "Contemporary Ceramics of the World", an anthology of artistic ceramics from the last third of the 20th to the beginning of the 21st centuries, a work that remains absolutely unique in Russian art criticism. Teaching has also been a crucial element in his career: Maloletkov has been a professor of the Moscow Stroganov Academy of Industrial and Applied Arts for many years and continues to teach composition there. Nevertheless, his dedication to art and maintaining his own creative independence remains at the centre of his life. Just as they have over the course of history, many artists today struggle to find their identity while remaining true to their ideals and beliefs. That is just what Valery Maloletkov has achieved, as was amply attested to by his major solo exhibition at the Russian Academy of Arts. Considering Maloletkov's oeuvre, one cannot help recalling the words of the famous French writer, Albert Camus*: "Perhaps the greatness of art lies in the perpetual tension between beauty and pain, the love of men and the madness of creation, unbearable solitude and the exhausting crowd, rejection and consent. Art advances between two chasms, which are frivolity and propaganda. On the ridge along which the great artist steps forward, every step is an adventure, an extreme risk. In that risk, however, and only there, lies the freedom of art." * Pour finir, peut-être touchons-nous ici la grandeur de l'art, dans cette perpétuelle tension entre la beauté et la douleur, l'amour des hommes et la folie de la création, la solitude insupportable et la foule harassante, le refus et le consentement. Il chemine entre deux abîmes, qui sont la frivolité et la propagande. Sur cette ligne de crête où avance le grand artiste, chaque pas est une aventure, un risque extrême. Dans ce risque pourtant, et dans lui seul, se trouve la liberté de l'art.